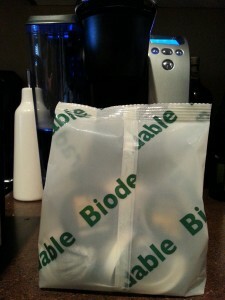 coffee Archives | Food blog! 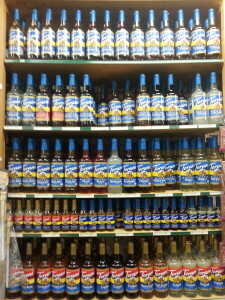 Torni is the maker of flavored syrups and sauces and popular for flavoring coffee and sometimes for adding flavor to tea, hot and cold. Product information such a nutrition facts and coupons can be found by visiting the official syrup makers online store which frequently features free shipping for many of the Torani Syrups. 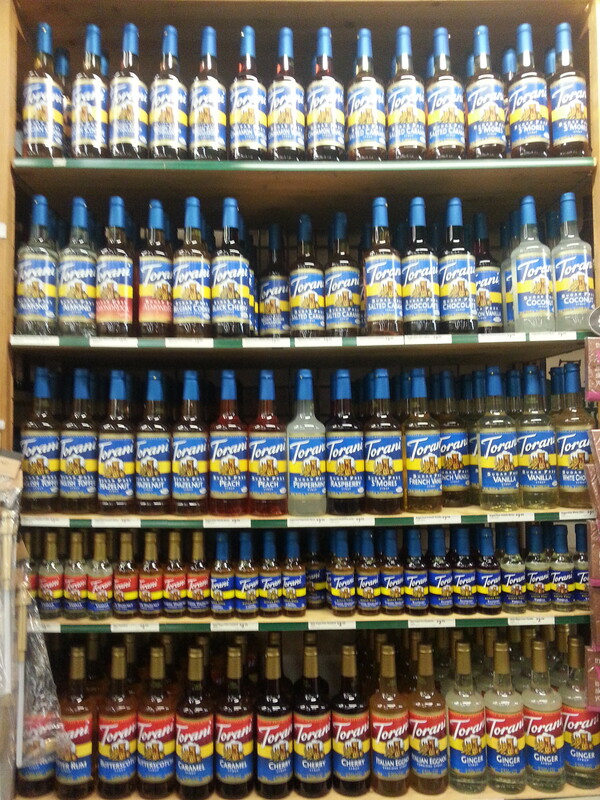 for favoring your favorite drink! 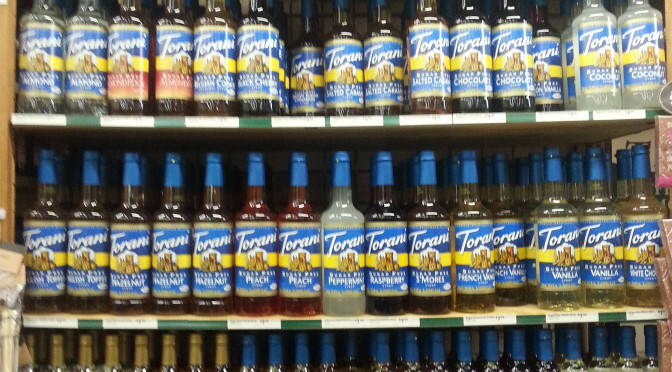 *flavors come and go check out Torani to see if your flavoring is currently offered. including some with free amazon prime shipping on the Amazon site. Don’t forget there are more uses for this list than just your morning cup of joe you can find recipes for sauces and drinks too! Enjoy! 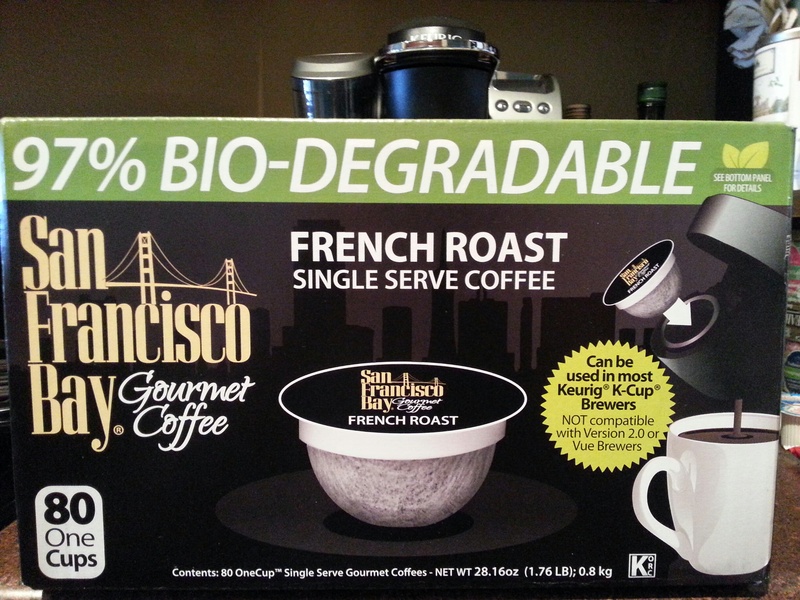 If you are like many coffee drinkers these days a fast world has put you in a position to make a fast cup of coffee and so today you are probably a Keurig owner, however, if you do own the coffee maker you are more than likely looking for a Biodegradable K Cup to take the place of the current pods you are using now. Why? 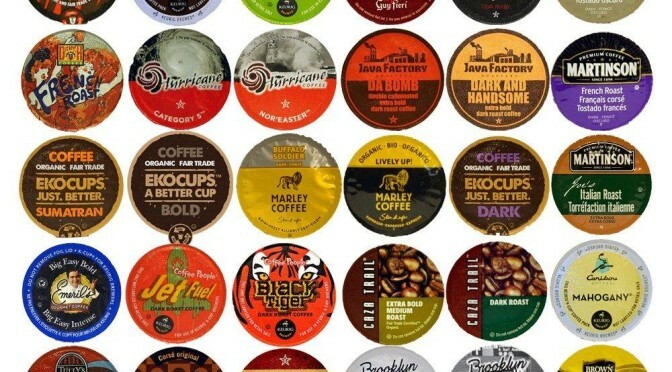 Despite being named “Fastest Growing Company” by Fortune magazine for the sixth year in a row, Green Mountain (the makers of the popular coffee maker), are also responsible for a trend that is setting the earth-savy – earth loving – eco hip – culture on a spirited push to raise awareness for how “wasteful” the popular k cups really are to the environment, read more about that k cup waste here. 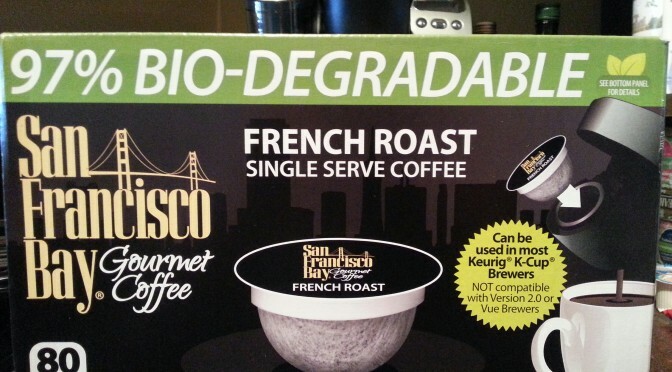 Where can you buy Biodegradable K Cups? Costco! 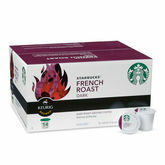 While shopping at Costco we found that the warehouse does have a stock of San Francisco Bay brand k cups. 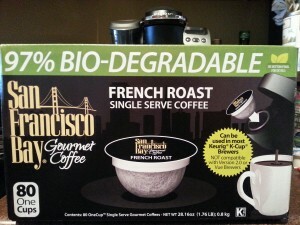 That means you can use the pods and they are 97% made biodegradable. 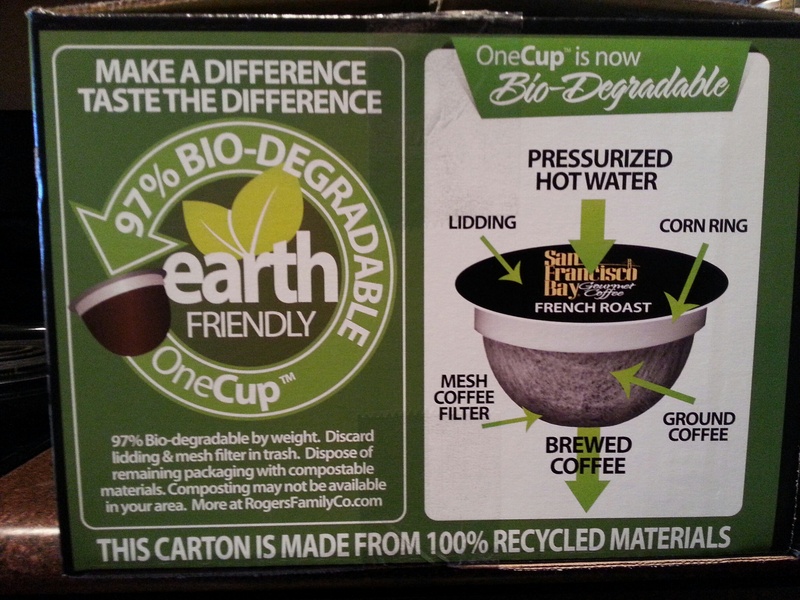 Meaning that if you try to recycle, or try to otherwise dispose of the trash created from the coffee pod it does shave bio-degradable properties, in fact, you can then choose to recycle the spent grounds either back into your potting soil and dirt and contribute even more to your eco-friendly lifestyle. 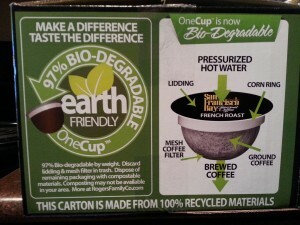 As you can see here the eco pods do not have the complete plastic “cupping” that holds most other brands coffee grounds. Instead the San Francisco Bay have the filter and nothing more! To hold the filter in place there is a “corn ring” secured to the main part of the cup. Even the bag that you get the coffee in is earth friendly! 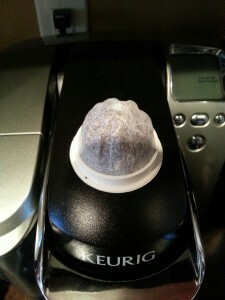 How much do the K Cups cost? 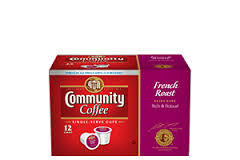 Well, for 80 pods at Costco we paid right at $25 making it about .31 cents per cup of freshly brewed coffee! 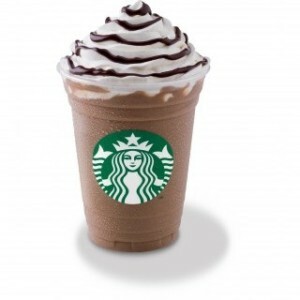 By popular demand here is your newest updated list of Starbucks Frappuccino blended beverages. Whether you are looking for that special pick me up for summer or even on a warm (winter) day look no further than this menu of the newest and most recent flavors that the beloved American coffee shop has to offer. 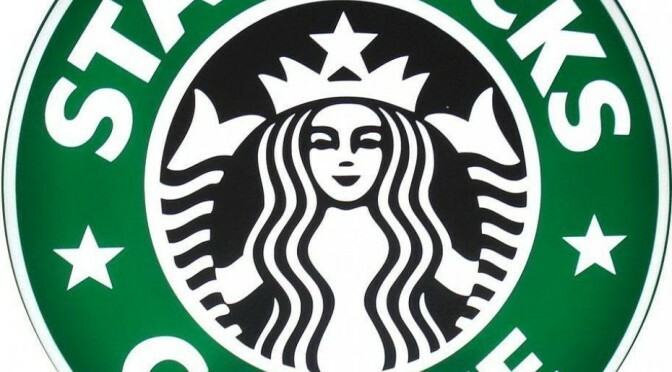 Typically starbucks does not offer coupons but they do have an active rewards program that you can save after frequent visits that in the end do reduce the price of you drink. Looking for that coupon discount on a Frap? Summer days usually bring “happy hour” o between 3-5 offering coffee at 50% off regular price!